uniFLOW Capture is a customizable solution that helps users capture, process and distribute documents around the organization. Users can be shown a series of personalized workflows that are relevant to their job role, allowing them to scan documents directly, into the relevant business processes or backend document management systems your organization depends on. uniFLOW Capture allows users to process documents scanned at MFPs, submitted to a hot folder, or received via email sent from a smartphone. 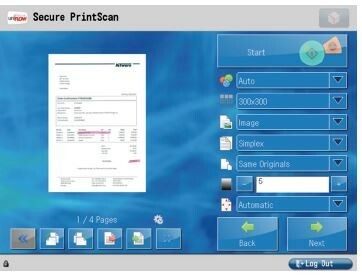 Incorporating uniFLOW Capture into your scanning procedures will provide greater document security and prevents unauthorized usage of your capture devices as users will be asked to identify themselves via variety of identification methods. After capturing documents, they can be automatically converted into fully searchable, editable and hyper-compressed documents that could be directly integrated to your back-end business systems. Scanned documents can be processed using zonal OCR or barcode recognition to extract information, which reduces the likelihood of errors associated with manual processes. With uniFLOW Capture, you can scan directly to email or to a networked folder. You can also take advantage of scanning to Cloud destinations including Box, Google Drive, Dropbox, Evernote and OneDrive. With uniFLOW Capture you can also distribute directly to several document management systems/enterprise content management systems.